The first step to a new kitchen is to discover what's out there, both online and in popular kitchen design magazines, and get an idea of what you'd like to achieve. 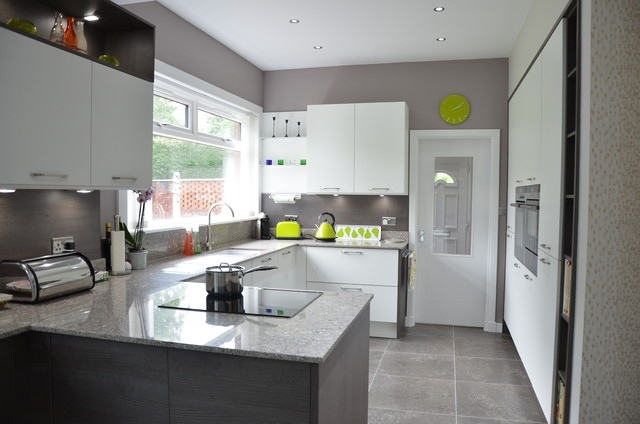 Once you've got a good idea of your dream kitchen, you can speak to one of our Colchester kitchen fitters to discuss what's possible for your budget and available space. 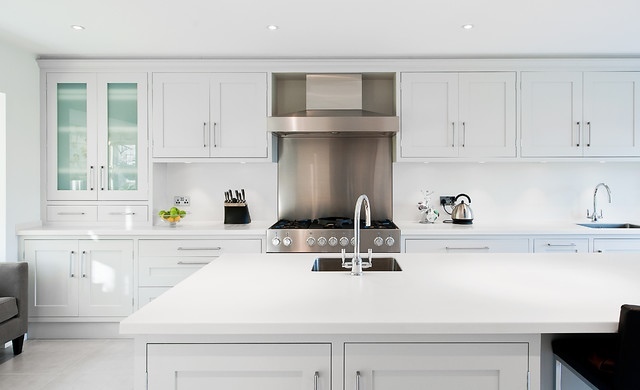 This modern kitchen in Surrey is the perfect place to entertain friends and relatives. There is plenty of seating and striking contemporary lighting with a matt finish, complimenting the silky black and white cupboards effortlessly without overpowering the room – the large natural speckled grey granite island top is the true highlight of this contemporary kitchen. Note how the kitchen is pulled together with just a handful of neutral tones, including the flooring and walls, for a fresh finish. 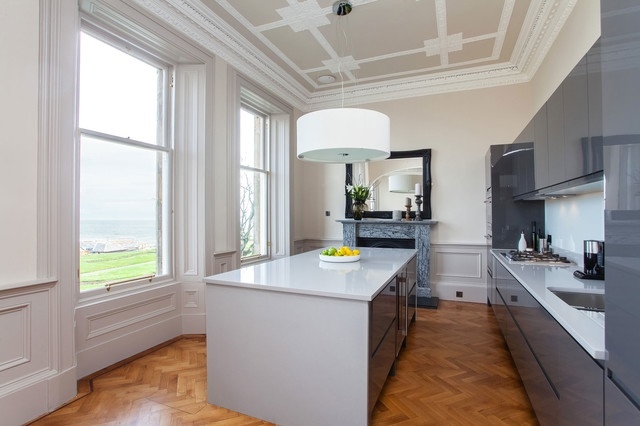 In St. Andrews, Scotland, this Victorian property boasts a clash of eras with a contemporary grey kitchen with seamless storage that benefits from large, traditional windows, allowing for heaps of natural light to flood in, and a breath-taking sea view. The best aspect of this kitchen mash-up is that the traditional fireplace, plaster work, and hardwood herringbone-pattern floor remain intact, highlighting the best of both classic and contemporary in a minimal, family-friendly space. We are huge fans of all-white interiors, and this all-white kitchen that's set off with black and grey furnishings and a striking all-metal stove is spectacular. Importantly, this kitchen boasts a large island and plenty of storage, allowing for the kitchen worktops to remain clear of clutter – adding to the clean-cut, contemporary finish. 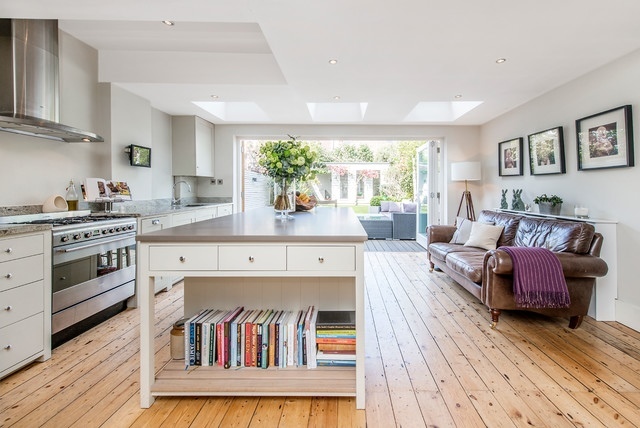 If you love open-plan living, this kitchen-living area in London is a superb example of what you can achieve in your home. Spacious, minimal living is at the heart of this kitchen, and a contemporary white and grey kitchen with marble tops sit in contrast against a traditional wooden floor and brown leather sofa – a clash of new and old. 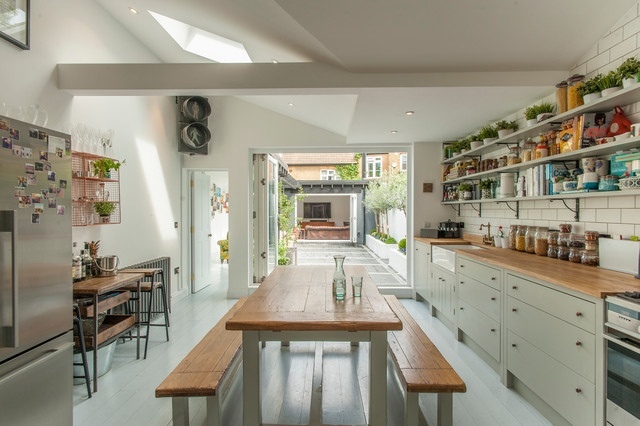 Natural light is one of the most important aspects of a kitchen, and that's why we love this indoor-outdoor kitchen in London. 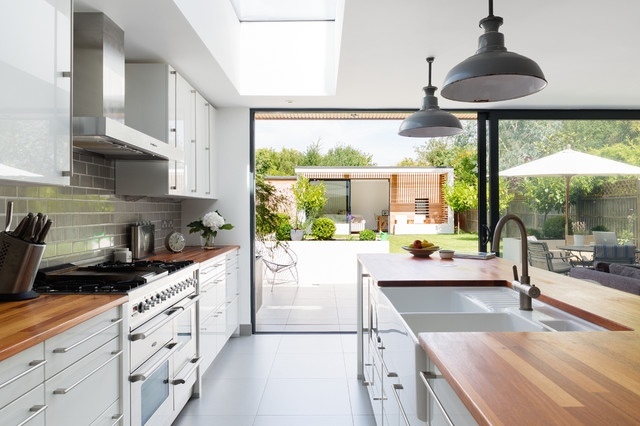 The minimal, contemporary kitchen is opened to the outdoors thanks to the use of large format tiles in both the kitchen and patio, emphasised by the large glass doors which completely open the space up. If your kitchen features wholly neutral tones in the form of white, grey, and the rich brown of varnished natural wood, you can add a hint of colour without overcomplicating the space. 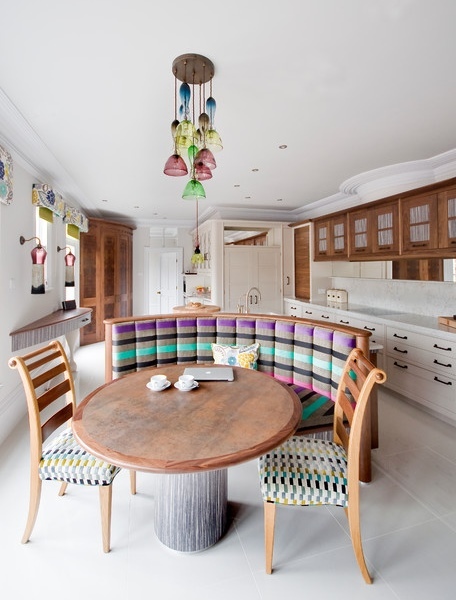 This contemporary kitchen in Retford, Nottinghamshire, does just that with colourful, patterned upholstered chairs and quirky lighting. This kitchen is sociable and has heaps of personality, which is what a home should be. 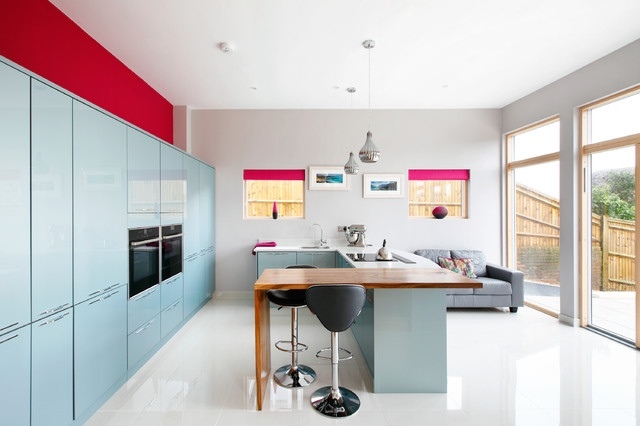 If you're a fan of gloss, this contemporary kitchen in Sussex offers bounds of inspiration. The metallic blue worktops and storage reflect the light perfectly, as does the white resin floor. Better still, this kitchen makes the most of the space with seamless storage solutions that sink back into the wall. The footprint of this kitchen is not that extensive, but the light makes it seem so – reflective surfaces are an excellent way to make a small space seem bigger which, helped by keeping surfaces free of clutter. A medley of traditional beauty, this green country kitchen in Twickenham, London, is all-wood for a truly classic finish. The white walls and subway tiles compliment the green and blue cupboards and floor seamlessly while the skylight floods the room with natural light. In this kitchen, contemporary spotlights have been strategically placed to brighten the kitchen even further, ensuring that the earthy palette isn't overwhelming or too dull. 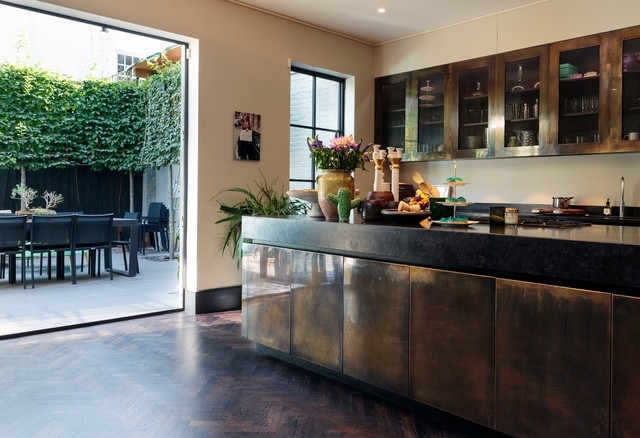 This eye-catching kitchen in Kensington, London, features dark herringbone hardwood floors uplifted by neutral walls and brushed glossy cabinets. Even though the kitchen decor is relatively dark, the reflective nature of its design, as well as its indoor-outdoor appeal, brightens the room for a fresh, open finish. A brilliant example of how a compact kitchen can still be a striking contemporary kitchen, this neutral kitchen features polished granite worktops and natural stone tiles for a sleek, modern finish, complimented with strategically placed spotlights to brighten the room even further. Colourful applications such as the lime green toaster and kettle help to brighten the space, too – if your kitchen is neutral and contemporary, always add hints of colour in the form of subtle furnishings. From thoroughly contemporary and high-gloss to understated matt finishes and traditional hardwood floors, there are numerous ways you can create an attractive, eye-catching and practical kitchen that's perfect day-to-day as well as for entertaining friends and relatives. If you're looking to have your kitchen renovated, contact us, and speak to one of our experienced kitchen fitters in Colchester, Essex.